If you are experiencing difficulties viewing this email click here to view in your browser. Editor: Stories paint a vision, share a lesson, capture an insight, give shape to experience, hold memory, supply a guidepost, forge a connection and unify us. On Saturday, 22 February at a Conference Centre in the city of Ballarat, in the south east of Australia, Mary Waskowiak rsm told stories out of our shared Christian and Mercy traditions (biblical and theological foundations of fundraising; mercy in action) and her own human experience that focussed our attention, recalled our history, gave voice to the 'invisible ones' and invited us to take action on their behalf. 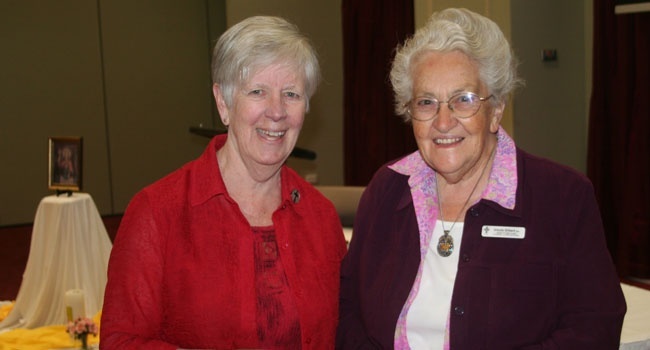 Image: l-r: Mary Waskowiak rsm (Americas) and Ursula Gilbert rsm (ISMAPNG) at the Ballarat Mercy gathering. In 1994, at the opening of Mercy International Centre, Sr Mary, then Chairperson of Mercy International Association, commissioned the First MIC Team of which Sr Ursula was a member. The title of the above article 'The shortest distance between two people is a story' is a quote from Terrence Gargiulo (2007). Photo: Anne Walsh. The refurbished building which had originally been built and opened in 1827 by Catherine McAuley was formally handed over by the architects, builders and other workers to the care of Mercy International Association on 31, March, 1994. Mercedes McCarthy rsm (GB Institute) Archivist had been working since February on preparing the Heritage display and organising the Archives. Josephine Grey rsm (Irl.) and Ursula Gilbert (ISMA) arrived to assist with the preparations and to help with the increasing number of visitors arriving at MIC. Between April and the official opening in July, 680 had signed the Visitor’ Book and this was less than half of those who had actually come! In the two years of considering the co-sponsorship of Baggot St, members of the Steering Committee grew to appreciate this forum as a means of Mercy discovering itself in a global context, with potential for multiple fruitful linkages across the world. The spirituality of fundraising assumes relationship: relationship with the Holy One, the Beloved, and with one another. For the fourth consecutive year Mercy International Association is offering a month-long renewal programme for vowed Mercy women who are seeking refreshment and renewal. It offers participants the opportunity to take time out in an atmosphere of warmth, hospitality, and internationality in order to discern more clearly the invitation of the Spirit in how to live out the mission of Mercy in our church and world. Participants in the month long programme have the opportunity to live in or to be non-residential. If undertaking two weeks of the programme then participants are non-residential. Book online to reserve your place. Soup and Substance: Let's Live Lent! Editor: Since 2010 when the MIA team first offered the 6 week Lenten Luncheon series 'Soup and Substance', attendees have been able to enjoy a simple lunch fare while learning about current injustices of our global society and exploring ways of responding that promote a more just and peace-filled world. For those unable to attend these sessions in person, the informative reports published in Mercy E-news have provided insight and opportunity for reflection. Beginning in 2013 this series is offered each Wednesday in Lent under the banner of the Inter-congregational Religious on Eco-Justice in Ireland on the themes of Cosmology/Eco Justice & Human Trafficking which are the two issues which MGA addresses globally. Learn more about the presenters and programme for 5 March. Almost half of the world’s wealth is now owned by just one percent of the population. The reality is grossly unjust. Mercy Global Action is needed. The report in English and in Spanish is linked to this item. MIA invites prayers for the safety and security of the peoples of the countries where there is tension, internal conflict and violence. While we can name the Ukraine, Thailand, Iraq and the Central African Republic (CAR), as centres of unrest, because of news reports we receive on our screens, we are aware that in other parts of our connected world there is division. As a Mercy community we pray with those in need of prayer. We pray this week with the intercession of Catherine McAuley for all whose have previously asked us for prayers. ‘How could we expect our lay colleagues to carry the mission forward, when we were letting the very source of inspiration for Mercy mission and formation in the charism deteriorate? Have we heard your Mercy story? Have we viewed your Mercy story? Have we told your Mercy story? Send us your news and help build the global Mercy community online. For the third time, the USDA (U.S. Department of Agriculture) has awarded Mercy a $382,748 grant which will ultimately provide greater access to health care in some of Mercy’s most rural communities in Arkansas, Missouri and Oklahoma. Waiatarua Mercy Parklands Auckland, the Ellerslie-based aged-care facility, has been named as a Centre of Excellence for Spark of Life, the specialised programme it has introduced over the past five years for its 97 residents, most of them requiring hospital care. A plaque confirming the status, a world-first, was presented at a ceremony on Friday 14 February by Australian Jane Verity, the founder of Spark of Life and currently CEO of Dementia Care Australia. ...This one's for you. The 30th anniversary movie directed by Jake Scott, son of Ridley, who made the 1984 Superbowl TV ad that introduced the Macintosh on 24 January, 1984. This movie was professionally scripted and lit, then professionally shot and edited using a number of iphone5s. Mercy Parklands is committed to providing a Mercy Model of Care that is holistic, encompasses and reflects our Mercy values, and enables each person to live the Mercy vision. 'We are challenged to link with one another...so that the broken heart of mercy can enter more deeply into us and embrace God's beloved poor. No event of particular significance is recorded in the Mercy Through the Years Calendar as having taken place on 26 February. We know, however, that the Works of Mercy continued to be carried out and so we remember on this day Catherine and all our Sisters, Associates and Co-workers who have given their lives in service to others. We invite contributions for this date to be be added to the mercyworld.org online calendar. Don't forget! Orders for LCWR's reflective print resource ' Praying in These Emergent Times' need to be lodged by this coming Friday, 28 February. This 56 page paperback is offered at US$5.00 (plus shipping), and discounted rates are available for ordering in bulk. Find out more details of this year's theme and order your copies online. Mercy World E-News is the Online Newsletter of the Mercy International Association. We hope you value this email. However, should you no longer wish to receive this eNewsletter, please unsubscribe.